Now that the holidays are over, many people are looking to start eating healthier and to lose weight. I am not trying to lose weight but I do like to keep my weight in check. I was recently contacted by Weight Watchers by Conair to see if I wanted to try out one of their digital scales. I was sent a small, sleek white glass scale to review. 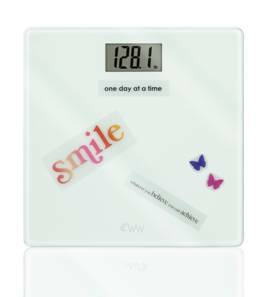 What is really cute about the scale is that it comes with stickers that have inspirational messages on it. I really like how sleek the scale looks and looks great in my downstairs bathroom. I am a big fan. Also, it is affordable compared to many other digital scales. I have had another Weight Watchers scale for 4 years now and really like it. Please note: this is not my weight. This is just an image of the scale from the company. The sleek, slim silver glass scale has an easy-to-read 1.5” digital display. The scale is 12.4” X 12.4” and has a 400-lb. capacity. The scale runs on one long-life AAA lithium battery (included) and has a 10-year warranty. The Weight Watchers® by Conair™ Digital Scale (Model WW58S) is available nationwide at stores such as Kmart and Kohls, as well as at www.conair-store.com for an average retail price of $29.99. The giveaway will be for your own Weight Watchers by Conair scale (a $29.99 value!). Disclosure: I received this scale for free for my review on my blog. All opinions are my own. I was not compensated for this post. No New Year's resolution other than to keep working on what I'm already doing. I do and it's to save enough money to move back home...that and keep on losing weight. To get a beautiful white Standard Poodle girl! Teach more tricks to Issabella, my black Standard Poodle girl..
My resolution is to eat healthier and to be more active. I have Diabetes so my resolution is to lose weight and get healthier. I do make resolutions.. I try hard to stick to them. This year I am determined more then ever. I resolve to finally get in shape and get healthy. I've always had weight issues, and since having my son I've made it a mission to get fit and healthy. This year, I wont lose that ambition! Thank you for the chance to win this awesome prize! The scale I have now is very basic.. this would be great! Lowering our grocery bill by planning our meals for the week! To eat healthier & stay away from GMO's in my food and get educated on where my food comes from! Yes I do, and it's to lose weight and to eat healthier. I need to keep track so I don't gain the fated freshman fifteen! There's many things I ought to resolve to do, but I'll refrain, it's too disappointing when I don't keep them. My new year resolution is to have a healthy lifestyle. Go to bed early and get up early. Also have a perfect diet! Losing weight is important to us this year, but it's more about being healthier and making better decisions about what we're putting into our bodies. Mine was to lose weight, but it's going slowly. my goal is to lose 15 lbs before summer! To eat healthy and get more active. My resolution is to exercise more often. To work on my store! My New Years Resolution is to be more productive in my spare time. To live life to the fullest and not to let people that dont matter rule my life! I would like to win the Weight Watchers by Conair scale. I think its awesome that it comes with those stickers... Makes weighing yourself a little easier. To get into better shape! More working out. I do not make resolutions anymore but my first short term goal is to lose 20lbs by the end of Feb.
No resolutions but doing very well with not smoking.